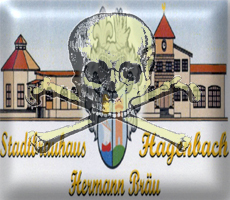 Opened in March 2001 the Brauhaus zur Post can be found in the city of Frankenthal at Neumayerring 43-45, 67227 Frankenthal, Tel: 0 62 33/22 02 86, Fax: 0 62 33/22 03 69. Open from 10:00 to 01:00 every day this pub has one very large room which can cater for up to 220 people with 2 additional side rooms holding another 100. There is also a beergarden with seating for up to 400. 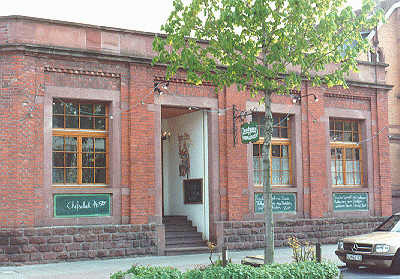 This brewery was owned by the relatively large Bischoff brewery of Winnweiler. This is a new tendency which is becoming more common in Germany whereby larger breweries are starting their own spin-off Hausbrauerei to get a share of the popularity and profit of the highly successful independant brewpubs. Other larger breweries such as Binding and Hoepfner also own brewpubs and it is becoming difficult to determine if a small brewery is really independant. The supporting breweries rarely advertise their presence or ownership. Hopefully we will not end up in a situation like Belgium where many of the apparently independant breweries are in fact owned by the giant Interbrew concern. Beer quality is what most concerns us here and unfortunately the Post beers were particularly disappointing. Brewer Dirk Schmitt produces a Helles which a Pilsener style unfiltered beer, pleasant and drinkable although without any distinguishing character compared to other Pilseners which are available in virtually all the brewpubs in this guide. The Brauhaus Dunkel was sour and undrinkable. A second try later resulted in a slightly less sour but equally undrinkable sample suggesting a serious contamination problem with the brewing process. The final beer tested was the Brauhaus Weizen which was actually darker than the Dunkel and suffered very slightly from the same sourness presumably resulting from cross contamination with the other brews. One sincerely hopes that this problem is only temporary or new beer drinkers will go back to sterile lagers rather than try real ale. The brewery also has its own Website for more information. Since the Bischoff brewery has now closed it is not clear if their beer is still brewed on the premises. The small town of Winnweiler was the setting for the 130 year old relatively large private brewery by the name of Bischoff. 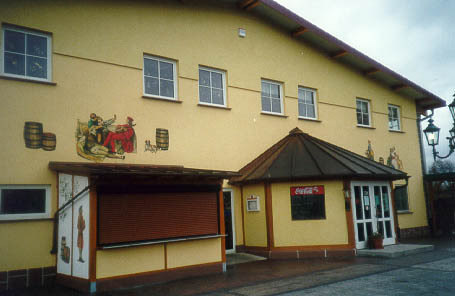 The brewery was at An den Hopfengärten 6, Tel: 06302 9120, Fax: 06302 912120. 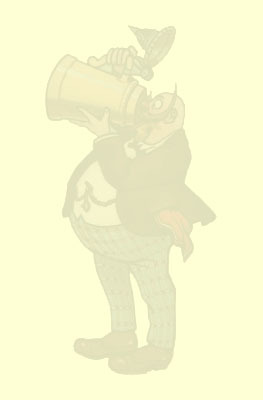 Although there was no brewery tap as such the beers could be tried in town or in a number of other pubs in the region. 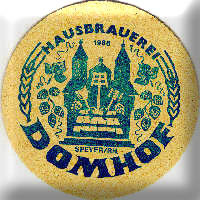 They produced a wide range of beers including Pils, Export, Falkensteiner Weizen, Ur Weiße, Ur Schwarze, Donnersberger and Doppelbock. 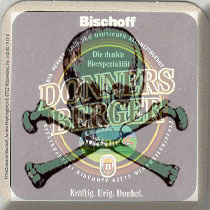 The Donnersberger was a nice ordinary dunkles, if a bit on the thin side and the Doppelbock at 7.5% Alc. although pleasant had a slight shandy like flavour which is not characteristic for this beer style. This Brewery has unfortunately closed. 35 km north of Karlsruhe along the Rhine valley lies Speyer which is a beautiful town dominated by its imposing Romanesque cathedral whose origins can be traced to settlements from the Stone and Bronze ages. Just outside the cathedral to the right one can easily find the Domhof brewery at Himmelsgasse 6, Tel: 06232 74055 Fax: 06232 71271. Established 1988 this brewery has the best beer garden in the whole area, which even though large fills up quickly on sunny days so fortunately there is also plenty of room inside the main building. Good food is available from a varied menu with local specialities and very good Helles and Dunkles beers compliment the food perfectly. 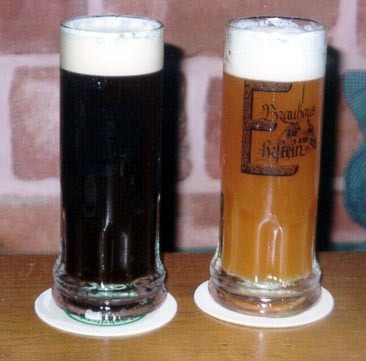 A number of speciality beers are produced such as the excellent Nikolausbock which are only available for a short time around the special days concerned. 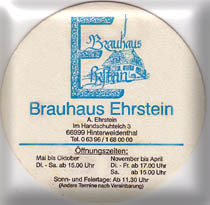 Brewery opened in 1999 and previously owned by Hoepfner of Karlsruhe, the Brauhaus Neustadt has been built on the original site of the old Pfalz brewery which was finally demolished a few years earlier. The full address of the brewery is Martin-Luther strasse 60 in 67433 Neustadt an der Weinstrasse, Tel: 06321 185155 Fax: 06321 185166. Situated next door to a shopping centre this is a large barn sized building with plenty of space inside and two levels on which to eat and drink. 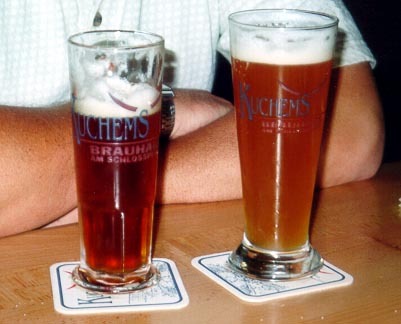 At the time of tasting the beers available were Helles, Dunkles and Nikolausbock and unfortunately with the exception of the Helles the two other beers were of extremely poor quality with a pronounced un harmonic balance of taste. It has to be seen if the beer quality improves with time as with many of the new breweries this has been the case after a years operation. Otherwise the pub has a nice atmosphere with occasional live music and a paved beergarden which can seat up to 600 people. News 2009. Brauhaus Neustadt no longer brews and sources its beers from the excellent Ottersheimer Bärenbräu. News 2015. Seems to be brewing again since they offer brewery tours and a seminar. News 2018. Brauhaus Neustadt now demolished to make way for a Lidl supermarket. 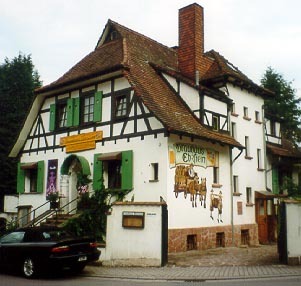 Opened in 2007 the Jäger Bräu can be found in the pleasant town of Edenkoben which is predominantly a wine growing region. 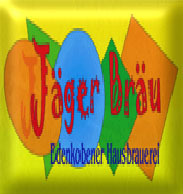 Run by Herr Jäger the brewery can be found in the Staatsstraße 18, 67480 Edenkoben, Tel: (06323) 937641. 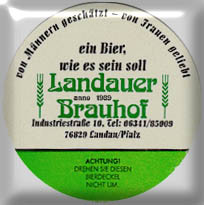 The brewery produces a Pilsener style Landbier, a Munich style Dunkel, a Weizen and a seasonal strong 7.2% Alc. Heller Maibock. An interesting varied daily menu is also available. This brewery will take a little effort to find as is it is well hidden away in the small village of Böbingen well off the beaten track. Take the Edenkoben exit from the A65 motorway and then pass through Venningen and Altdorf until the turn off for Böbingen. 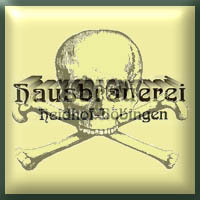 The hausbrauerei Heidhof is at Hauptstrasse 85, Tel: 06327 1523, Fax: 06327 1524 and is run by the Heid family. Günter Heid the brewer follows the family brewing tradition set by his grandfather and produces Helles Export, Dunkles Doppelbock and Dunkles Hefeweizen year round. The 12% Stammwürze 3.8% Alc. Export is an excellent full flavoured quite fruity beer, unusual for the area which is mostly dominated by hoppy dry Pilsner styles. The 17% Stammwürze 7% Doppelbock is dark, full of flavour and very smooth, one of the finest examples of this beer style available anywhere and well worth any detour. Even more exceptional is that the Doppelbock is brewed year round which makes it a real treat. Homemade Weißwürste or Alsacien Flammkuchen are available as well as fish specialities to accompany the beer. Open Thursday to Sunday from 11:30 and Wednesday from 17:00 this is a must visit brewpub. This Brewery has unfortunately closed Jan. 2004. A great loss !. Located in a new shopping development near the Schlossplatz Kuchems Brauhaus can be found in the Hauptstraße 13-15, 66953 Pirmasens, Tel: 06331 213894, Fax: 06331 213895. Open Monday to Thursday from 10.00 to 24:00 and from 10:00 to 01:00 Friday and Saturday but only open from 16:00 on Sundays and public holidays. 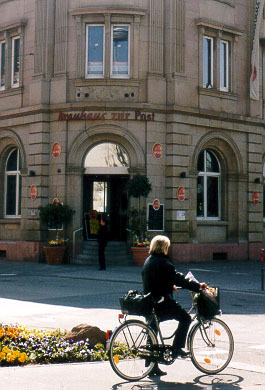 This modern brewpub overlooks the Schlossplatz from its balcony and is owned and run by Wolfgang Kuchem who comes from the large Park Brewery in Pirmasens. 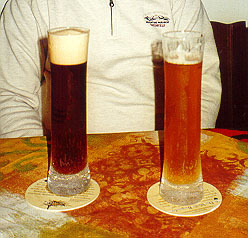 Beers are served in atractive 0.25 l fluted glasses but are also available in a larger 0.5 l variety. 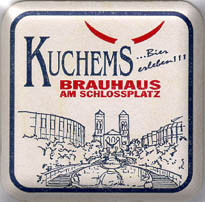 Beers available include a classic "new German brewery" style Hell which has little aroma and is relatively bitter with a dry aftertaste. Very similar to many other new brewpub beers this is pleasant but has no outstanding characteristics. Also available is a Dunkles which is quite pale in colour with a similar character to the Hell except for a smoother slightly malty finish. A fairly heavy yeasty Weizen was also on tap which was not particularly harmonic. These beers are all pleasant and worth a try if you are in the area, but probably not worth a large detour. A speciality Festbier should be available from the end of September and a Dark Bock called "Kuchems Edelstoff" from the 1st November. As concerns food, a varied menu is provided which should cater for most tastes and is of good quality. Travelling NW about 30 km from Karlsruhe in the city of Landau is the Landauer Brauhof at Industrie strasse 10, Tel: 06341 85009. Situated in the Pfalz region this 1989 established micro is in a converted warehouse which apparently used to be a brewery 60 years ago. With maize and hops hanging from the ceiling the brewery has an inviting atmosphere and naturally excellent beer. Helles, Dunkles and Hefe-Weizen are available year round plus specialities such as Mai bock from the end of April, Festbier during the Munich Oktoberfest period, Geburtstagsbock in November and Nikolator Christmas beer in December. A varied food menu is also available and a magazine is also produced regularly detailing special events. The brewery has no beer garden in Landau so they have opened another outlet in Speyerdorf, Altenschemel 24a (18 km North of Landau near Neustadt) called the Blockhaus Tel: 06327 5474 for outdoor drinking. News Jan 2004. The Landauer Brauhof now has a new brewer. The beers have changed considerably especially the Dunkles which is now a sweeter Märzen type instead of the original excellent very dark brew. The constant modern music may also not be to everyone's taste and they are evidently trying to attract a different clientele. Also now, although there are numerous blackboards scattered around advertising everything from forthcoming events to special food offers there is no mention of the beers available, as if they don't want anyone to realise that this is in fact still a brewery. News 2009. Not surprisingly given the problems mentioned earlier the Landauer Brauhof no longer brews and now sources its beers from the excellent Ottersheimer Bärenbräu. Tucked away in a small village in the Pfalz hills on the road to Pirmasens, it is worth making the effort to find the small Brauhaus Ehrstein. The full address is: Im Handschuhteich 3, 66999 Hinterweidenthal, Tel: 06396 1680000, Fax: 06396 993192. Open from 15:00 Tuesday to Saturday from May to October and 17:00 the rest of the year. Open Sundays and public holidays from 11:30, but it is best to telephone ahead to check, and if necessary reserve a place as space is limited. The beers available include an extremely cloudy almost soupy Helles which is rather like drinking a glass of liquid dough and is a meal in itself. A dunkles is also on tap which is almost as yeasty as the Helles but has a distinct chocolate malt aroma and taste which gives it a quite different character. A full bodied Dunkles Weizen was also available for the tasting which is less heavy than the other beers and has the classic banana aroma and taste so often found with this beer style. All in all an interesting selection of beers which have their own character but which may be too heavy for some. It is worth having a look at the small brewery downstairs and also trying one of their speciality "Flammkuchen" which are baked in their own wood stove. A small beergarden can be found outside if the weather is nice but you would be wise to bring some mosquito repellant unless you want to become a meal yourself !. 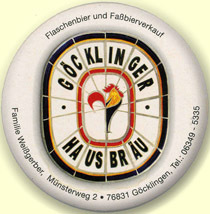 Established in 2004 and situated quite centrally in the little town of Göcklingen you can find the lovely unspoilt Göcklinger Hausbräu run by the Weißgerber Family in Münsterweg 2, 76831 Göcklingen, Tel: 06349 5335, Fax: 06349 96 31 07. With a reasonable amount of space inside and a small beergarden, this welcoming brewpub merits a visit. Service is friendly and good rustic quality food is available. Especially worth a visit on Friday or Saturday when they have delicious "half chicken" evenings from 18:00. Make sure you ring ahead to reserve, as this is only available as a (pre-order). Recommended to visit during December to sample the excellent dark malty Doppelbock. Open from 11:00 May to October and from 16:00 November to April except weekends when it is open from 11:00. Closed every Wednesday. You can find Tourist info, Walking maps and some downloadable English brochures on the Göcklingen towns Website. The brewery has an impressive choice of quality beers throughout the year. Göcklinger Hell, 12,5% Stammwürzgehalt 5% Alc. Göcklinger Dunkel, 12,5% Stammwürzgehalt 5% Alc. Göcklinger Weizenbier, 12,5% Stammwürzgehalt, 5% Alc. Göcklinger Maibock, 16,5% Stammwürzgehalt. 6% Alc. (Available from the 23rd April). Festbier, 12,8% Stammwürzgehalt, 5,5% Alc. (Available from September). Dunkles Hefeweizen, 12,5% Stammwürzgehalt, 5% Alc. (From October). Bockbier, 16.5% Stammwürze 6.5% Alc. (Available from the end of October). Doppelbock, 18% Stammwürzgehalt 7.5% Alc. (Available from 6th December). The Brewery also distill their own 35 % Vol Bierkräuterlikör, 38 % Vol Bierbrand and 50 % Vol Hopfenfeuer. The small Ottersheimer Bärenbräu is a wonderful beer oasis for the area. They don't yet have another outlet for their beers (although one is planned for Germersheim) so their beers can only be obtained from the brewery itself or taken away in 1, 2, 5, 10, 15, 20 and 30 liter bottles and barrels. 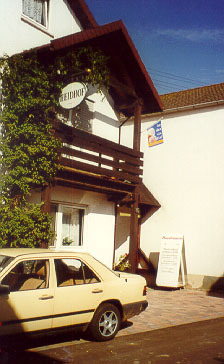 The full address of the brewery is Waldstrasse 35a, 76879 Ottersheim, Tel: 06348 7595, Fax: 06348 1271 and there are signs in the village indicating its location. Open from 11:00 to 22:00 Monday to Sunday, you will usually find Helles and Dunkles available from Monday to Wednesday and Helles and Weizen or a seasonal beer from Thursday to Saturday. You can now visit the Bärenbräu during the summer months and enjoy their beers plus excellent local home cooked food and friendly service. Remember seating is very limited so be warned. The 12.3% Stammwürze 5.2% Alc. Hell is a refreshing, smooth and very drinkable beer. The 12.5% Stammwürze 5.3% Alc. Weizen is top fermented with a nice banana aroma and is also highly drinkable especially in the warmer months. The other regular Bärenbräu beers, Pils and Dunkel have yet to be tasted. The following seasonal beers should be available on the dates shown below. 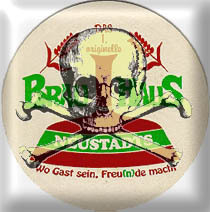 A 13.5% Stammwürze 5.6% Alc Schwarzbier from the 1st of February. A 12.6% Stammwürze 5.3% Alc Frühlingsbier from the 20th of March. 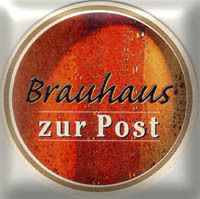 A 16.5% Stammwürze 6.5% Alc Weizenbock from the 23rd of September. A 13.2% Stammwürze 5.5% Alc Weihnachtsbier from the 6th of December. 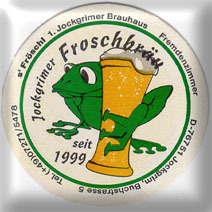 The Froschbräu brewpub opened at the end of 1999 and is situated in the town of Jockgrim which is just to the north of Worth. The address is Buchstrasse 5, 76751 Jockgrim, Tel: 07271 5478. Only open from 17:00 Tuesday to Friday and 18:00 Saturday and Monday. Sundays and public holidays also open fron 11:30 to 15:00 and then again from 17:00. Closed Mondays from November to April. A modern fairly unimposing building with a beergarden on the street, this brewpub serves 3 beer types with specialities available in winter. The interior is warm, pleasant, well laid out and nicely decorated especially at Christmas time. As for the beers, the Frosch Hell is an unfiltered Märzen style beer with a golden colour and a lightly sweet nose. Lightly carbonated it has good balance and is a very pleasant drink with a slightly sweet aftertaste. In fact the Frosch Hell is a refreshing change to the Pils style beers available in most of the other brewpubs in the area and is well worth a try. A Dunkles is also available with a mid brown colour and more pronounced maltiness which emerges as the beer warms. The initial taste is a little harsh but improves later. The Dunkles is also more carbonated than the Hell. A bitter strong Alt-beer type very dark Christmas bock beer available in December is also well worth a try. Weizen beer is also available in summer and this is a fairly standard Weizen with a slight hint of Vanilla. Good but not exceptional. The brewery now has its own Website for further information. 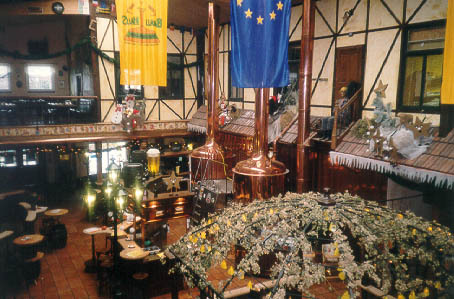 The Hermannbräu in Hagenbach unofficially opened in June 2006 and was fully operational by the end of September. Owned and run by Hermann Flick this is a large open plan, barn style brewpub situated in the industrial area of Hagenbach. The full address is Stixwörth Strass 2 - 4, 76767 Hagenbach, Tel: 07273 800765, Fax: 07273 800766. The brewer who gained his diploma in Bamberg produces an excellent Märzen style beer which they simply call "normal". This is very reminiscent of the beer found around Bamberg and is particularly unusual for the Pfalz. Coppery coloured, smooth and mildly sweetish this highly drinkable brew makes an excellent session beer for those warm Summer evenings. 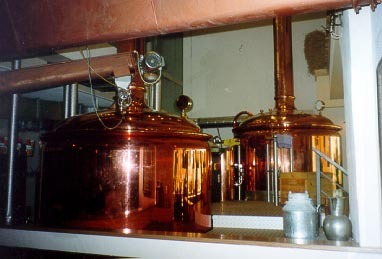 A Weizen beer is also produced and further seasonal brews are planned as the brewery becomes established. Service is quick and friendly and there is a reasonably priced menu to accompany the beers. Open from 16:00 to 24:00 Wednesdays to Friday, 14:00 to 24:00 Saturday and from 10:00 to 24:00 on Sunday. See the brewery Website for up to date information.